I have been using Myprotein whey supplements for a few years now (ISO PRO 97 & Impact whey) and have found both to be effective e.g. they mix well, taste just fine and have proven to be an effective supplement. Up until 8 months ago I would take one of the above immediately after training to aid recovery and assist development of muscle tissue after training, however after reading articles on the best time of day and type of supplements to take I started taking a whey supplement prior to training. As I train first thing in the morning I find this convenient and have definitely noticed improvements in training performance and overall gains in muscle development. I admit the gains are not ground braking, but they exist and are noticeable. So I got to thinking and decided I would start experimenting by taking a Casen protein in the evening, and monitor the results and effects. First off this has certainly helped me resisting from snacking on unhealthy items such as biscuits and cakes etc in the evening, as I eat quite clean during the day and do get the cravings for a sweet snack in the evenings when I know the wife has them hidden in the kitchen cupboard. Secondly I have definitely noticed a difference in the recovery from hard sessions, previously I would be sore (DOMS) for a few days after a particularly tough workout, whereas now I wouldn’t say I was as fresh as a daisy the morning after, however I am able to commit to another good session the following day. OK, now the taste test, I choose chocolate, the taste is fine however does leave a little powdery after tang, but I don’t find this to bad at all as I am usually brushing my teeth and having a glass of water soon afterwards before hitting the sack. The powder mixes fine (I use skimmed milk) and as long as you use a shaker and spend 20 seconds of vigorous agitation leaves no lumps or residue in the shaker. Overall a good supplement that is steadily helping me reach my goals without braking the bank or making me chug down foul tasting concoctions that make me wince and give nightmares. I love to eat my protein sources and have been making casein cookie dough with the unflavoured product and flavdrops, it's delicious and a great way to get your protein in and a dessert that requires no cooking or time. Recipe below if you want to try it, you won't be disappointed: 50g unflavoured casein 15g nut butter of choice 15g cookie butter (if I don't have any I double up the nut butter) 50ml almond milk MP Flavdrops (vanilla) add to taste Add a little of the almond milk at a time as you want the consistency to be that of cookie dough and mix it thoroughly . If I have some fats and carbs left for the day il throw in some chocolate chips. If you like you like it thicker try chilling in the fridge for a while. Usually i train in the evening after ive eaten so come late night my body needs something inside it and this is the ideal solution to that. I use it in a 2:1 ratio with my whey protein and it keeps me feeling full through the night until breakfast time without having to eat a big late night meal that sits heavy in the gut. You can use water and it mixes fine but i prefer milk, when mixed with my whey powder it actually tastes very much like a Mars milkshake but a whole lot healthier and filling, its all i can do to stop the kids nicking it all the time!! I use 500-550ml of milk and use 2 scoops of this and 1 scoop of whey and it all mixes lovely, not overly thick just the way i like it. It really does help with those aches and soreness after a heavy training session. This product works effectively in regards to what you want a casein shake to do, it mixes ok, not as good as Optimum Nutrition's one, and it tastes ok as a shake, again not as good as Optimum Nutrition either, which in my opinion is the best one you can buy, this product however is competitively priced which is why i opted to try it out, you get 700g more with MP for the same price as ON, in this regard though i do think you get what you pay for as ON is a better quality product, this however is a workable low budget option. oats, yoghurt, home baking recipes just not a good shake. Went for the unflavoured version of this stuff and can see straight away the problem with the foaming after shaking. Compared to other products the amount of foam left after shaking this product is crazy but there is a simple solution. I filled my shaker with 300mls or so of water and then added a scoop on top. I took a big spoon to the mix and gave it a stong stir for a minute or so. Result was a smooth shake with no lumps. Hope this helps. Quick & lovely as a night time porridge! This product was delivered (default delivery option) within two days of placing a Web order. Great service. It's very light and 'dusty' in texture and so needs some care when handling to avoid creating great plumes of powder. The chocolate flavour is excellent - I just add one scoop of micellar casein powder to 40 g of porridge oats and then 225 g of just boiled water. Mix and leave to stand covered for 15 - 20 minutes to make a delicious just-before-bed final meal of the day. Cover and microwave (900W, 2 x 30 secs, stir in between) if using larger oats for a softer tasty chocolate porridge. Tweak preparation according to personal preference. I'm no expert in sports/muscle hypertrophy nutrition but published peer-peviewed scientific literature indicates that casein before bed can be beneficial to overall goals. I use it together with porridge oats at the end of the day to complete and balance my calorific and macronutrient daily targets . . . and it tastes superb as well! One very happy customer. Tastes really good but it's a mess to use, like powdered snow seems to go everywhere don't wear black tee when mixing. Would recommend getting a tub to put it in as well. Chalky mix but it's favour is really good and for a finish end up eating the foam. Stuffed after it so works well. Good product got banana favour tastes good. 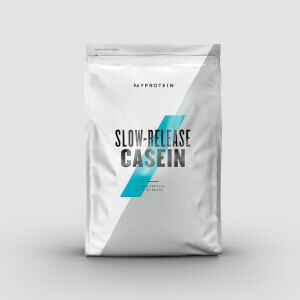 After doing a lot of research into this product and protein in general, I read an article saying to mix Casein with Whey post workout for maximum benefits. I swear by it now. You get the initial protein hit from the Whey and then this product slowly drip feeds your muscles for up to 8 hours after your workout ensuring you get the most from your workout both with size and strength. When mixing it does tend to froth up a bit but if you leave it to settle for a few minutes, it's fine. Really helps to stop the DOMS (Delayed onset of muscle soreness) meaning you can train again sooner.